Rupert Neve is one of the most revered names in electronic and audio equipment design. Naturally, I was excited to test a prototype from Rupert Neve Designs — the new RMP-D8, 8-channel, Class-A, remotely controlled Dante preamp and 24-bit, 192kHz A/D converter. I have some experience with similar Dante mic preamps from other manufacturers and was eager to put this to the test. As a live sound focused product, this represents somewhat of a new territory for Rupert Neve Designs, and it’s a direction I am happy to see. The rear panel includes Combo XLR-TRS mic/line inputs, Dante and AES outputs and sockets for two IEC cords for the internal redundant power supplies. My only complaint about the hardware is the front panel power button. I’m glad the RMP-D8 has dual redundant power supplies (which accept 100 to 240 VAC) lines, but they won’t do much good if you accidentally bump the power button on the front panel and turn the unit off. This may seem unlikely, yet stranger things have happened, and I would prefer a rear-panel AC switch. focused RMP-D8 would fit into my workflow. I could have converted the Dante output to MADI and connected that into my system, but instead I chose to use the RMP-D8’s AES/EBU outputs to feed my console’s local AES/EBU inputs. The inclusion of AES outputs was really a wise choice, because it makes the unit usable for both the Dante and non-Dante crowd. Honestly, the AES outs were one of my favorite features as these make the RMP-D8 much more flexible than its competition. One of the most common concerns people have with outboard, multi-channel preamps is how to control them. Do they need to be located right next to the console? Would a whole rack of them be difficult to control? The RMP-D8 is relatively easy to control, but there’s room for improvement as well. The first option is to have the unit physically adjacent to the console and manually control it from the front panel. With much thought and effort put into how the rotary knob looks and feels, the RMP-D8 is nice in this application. The large knob has a gentle click for every 1dB of gain added, so it is easy to reach over and dial without having to spend a bunch of time looking at the screen. The second option is the RMP’s PC control application, which is available for free on the company website. Currently, the application is PC only, I am told that an equivalent Mac version is right around the corner. The PC application is no frills, but gets the job done for controlling the RMP’s handful of parameters. Finally, Yamaha console users can control the RMP’s preamps right from the console gain rotaries. Yamaha has always been an industry leader in this regard, and I’m happy to see them continuing that tradition with the RMP-D8 and other similar Dante preamps. That said, I don’t use Yamaha consoles often, and I’d like to see reliable control integration with other manufacturers’ consoles. I want to control this from any console, so I’m hoping for this feature in the future, and I’m confident that it’s 100 percent achievable. Seeing as how the RMP-D8 is just a preamp and A/D converter, there are few settings that need to be configured. Of course, the Dante aspect adds the required element of network configuration, but once the unit is on the network and channels have been named, the settings are relatively straightforward. Connecting my computer to the unit to do some basic configuration using Dante Controller was a seamless process. I hardwired into one of the Dante ports, allowed my computer’s NIC to self-assign an IP address, and the RMP popped right up. From there, I was able to set the sample rate (48 kHz in my case), name the channels, and I was up and running. I flattened out my EQ’s, compressors and multiband compressors so I could really hear the RMP-D8 from a baseline starting point. Over the course of a few weekends, I used the unit on drums, bass, guitars and vocals. What I heard was a significant improvement over my console’s onboard preamps and converters. I noted in many cases that I was using my EQ’s less, especially on vocal channels. Vocals sat really well in the mix, and I was able to have a blend of vocal channels using the RMP-8 and vocal channels using my console’s preamps. On both instruments and vocals, when changing the gain just a single dB on the RMP-8, I heard and felt the difference immediately. The RMP-D8 sounded absolutely fantastic, and in many ways the difference is difficult to describe or quantify. Rupert Neve Designs clearly made Dante the focus of this unit. It is meant to live in a Dante environment, and that’s where it shines. 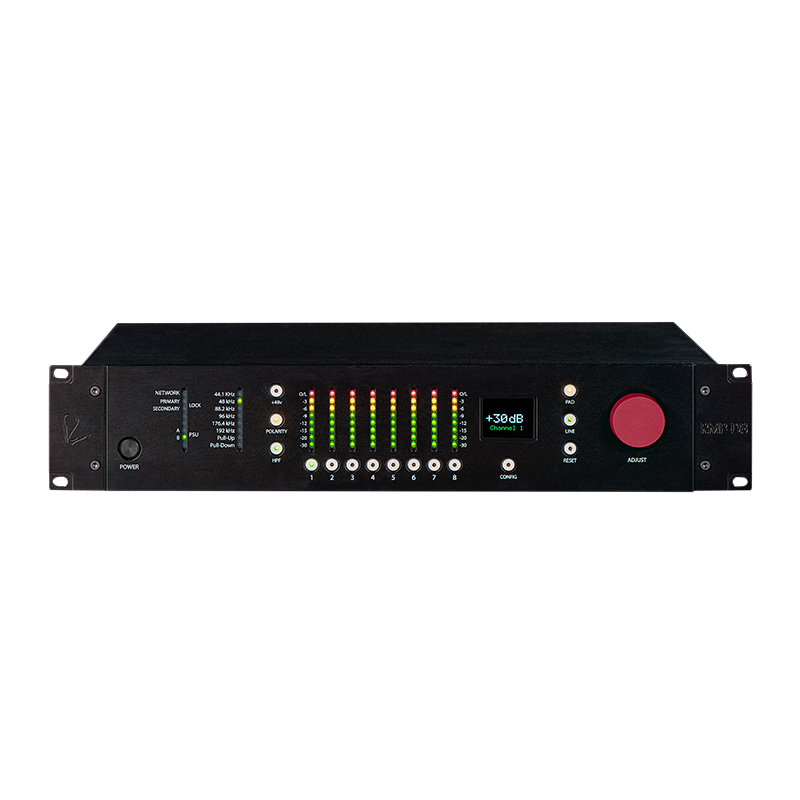 Audio routing from the RMP-D8 to other devices on the network takes place in Dante controller, as do many other settings including sample rate, bit depth, Dante latency, network configuration and channel naming. If you haven’t used a Dante-based preamp like this before, one curious feature is that the 8-channel preamp actually shows 16 routable outputs in Dante Controller. The preamp’s first eight outputs are successively mirrored to output channels 9 through 16, but the latter set of eight channels have a gain compensation feature that can be applied to each channel individually. If multiple engineers are sharing channels from the RMP-D8, the secondary set of outputs can be gain compensated so that any changes made to the analog preamp will be compensated for in the digital domain, maintaining a consistent level for all engineers. This feature makes the RMP-D8 a wonderful option as a high-end, universal stage rack that can be shared among consoles from various manufacturers. I could see using an entire rack of RMP’s in lieu of a digital console stage rack, or I could see using one or two units on key inputs (money channels) to supplement a larger digital console I/O system. The RMP-D8 is a pleasure to work with. All too often, live sound engineers (myself included) focus on the back-end processing such as plug-ins to define their mix. The RMP-D8 is priced at $5,995, but in this case, having a world-class preamp and converter on the front-end of some key channels really made a tremendous difference. This 8-channel mic preamp integrates seamlessly into both AES/EBU and Dante environments and the sound is certainly an upgrade from my console’s built-in preamps, adding a new dimension to the front-end of my mix.